Ranked #1 by Greenpeace for their sustainability mission, Wild Planet’s products include a line of top quality seafood such as Tuna, Salmon, Sardines, Anchovies, Mackerel, Yellowtail and Shrimp, as well as the company’s first non-seafood item —new Organic Roasted Chicken Breast. Available at retailers nationwide, each product is packed full of delicious flavor and nutrition. Wild Planet also produces sustainably sourced albacore, skipjack, salmon, sardines, anchovies, and shrimp. Wild Planet was founded in 2004 by William Carvalho and Bill McCarthy. These two industry veterans, with a combined 50 years of experience, wanted to start a company that addressed the need to preserve the natural marine habitat while still harvesting wild seafood. It is their vision that these needs can successfully co-exist. Wild Planet Foods is committed to providing the finest tasting, sustainably sourced seafood, while supporting the conservation of wild marine ecosystems. Wild Planet Foods emerged from the vision of Carvalho and McCarthy with a product line of eco-preferable wild seafood. The natural ocean ecosystem is an abundant food production resource that must remain that way; the name Wild Planet arose from this concept. 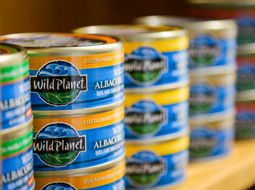 All of Wild Planet’s tuna is caught individually using pole and line methods. This ensures that no other marine life is caught or harmed in the process, unlike long-line and FAD (fish aggregating device) purse seine methods, which are employed by many national companies and endanger other marine species. Wild Planet’s salmon, sardines and anchovies are “free school” purse seine caught which means no FADs are used to attract the fish. 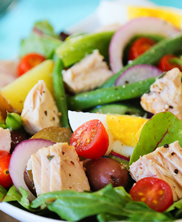 Wild Planet’s 100% pure albacore tuna in its own natural juices, which gives it straight-from-the-sea flavor.